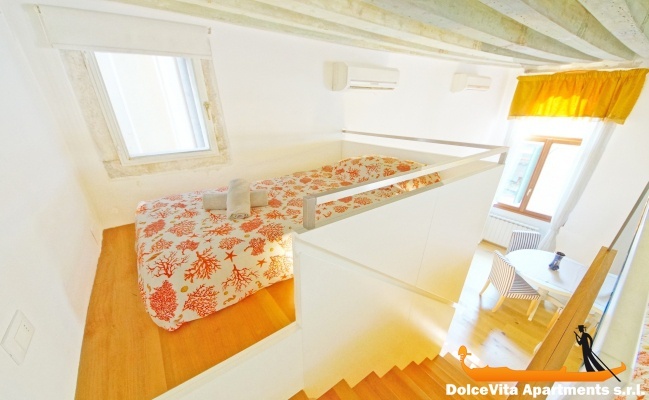 Apartment N. 168: It can accommodate up to 5 people, it is rented from 85 € per Night (not per person). 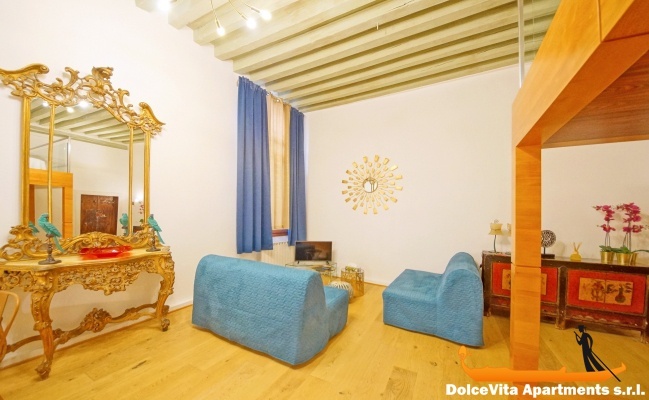 Luxury Apartment Rental in Venice for 5 people: Spacious and cozy apartment on the first floor of an historical building. 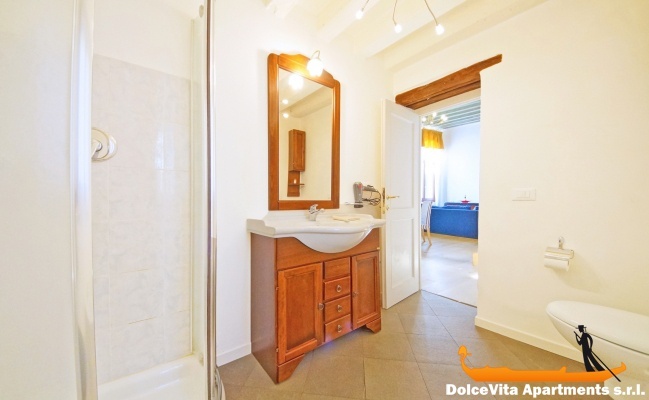 It consist of a large and bright open space, kitchen and two bathrooms with shower. 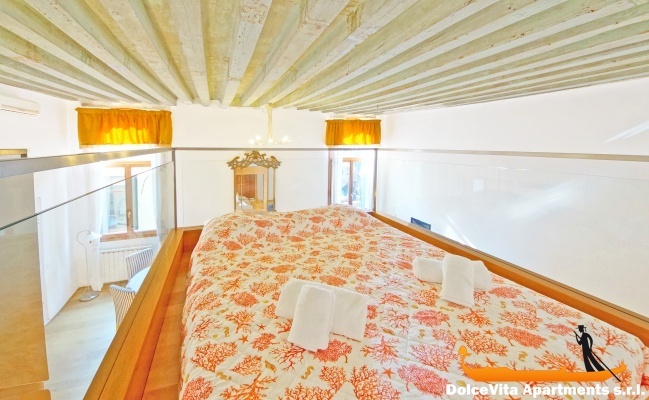 This comfortable apartment is in Castello district in the historical center of Venice. From the windows you can enjoy the wonderful view of “Rio de San Zulian” canal. The apartment can accommodate up to 5 people: a flight of stairs separates the double bed situated in the living area, from the other 2 beds (one double and one single). Suitable for those with small children as well since a cot is also available. The kitchen is fully equipped. Among the services included there are: free Wi-Fi, washing machine, refrigerator, freezer, heating system and air conditioner. 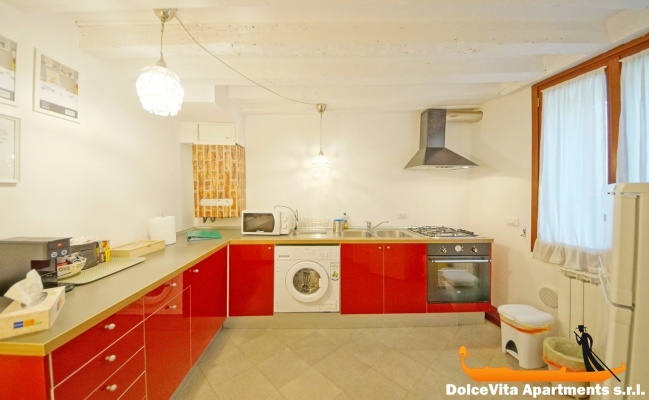 Easy for wandering about the city, this house is only 3 minutes walking from the Rialto Bridge, and 5 minutes from St. Mark Square. Well located and well equipped. Heating OK, hot water OK, wifi OK, equipment OK. The door to the street did not close well, it is quite improvable. Friendliness and ease of communication with the person who attended us, Elisa, although on Monday we could not communicate with her via whatsapp to communicate problems in closing the door. I like that the price was without surprises. The apartment is as seen in the photos and video. Very clean. Very attentive for the delivery of keys as they had contacted us and they came to wait for us at the vaporetto stop. 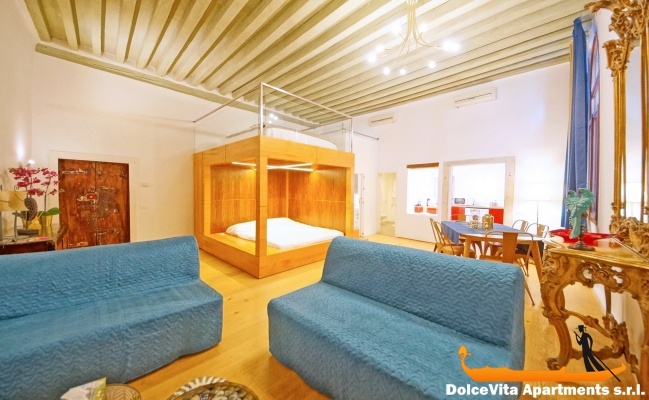 The location is very good: in a few minutes you can reach both Piazza San Marco and the Rialto bridge. All very well. The only negative thing to note is that the beds are not too accessible for older people or with little flexibility. 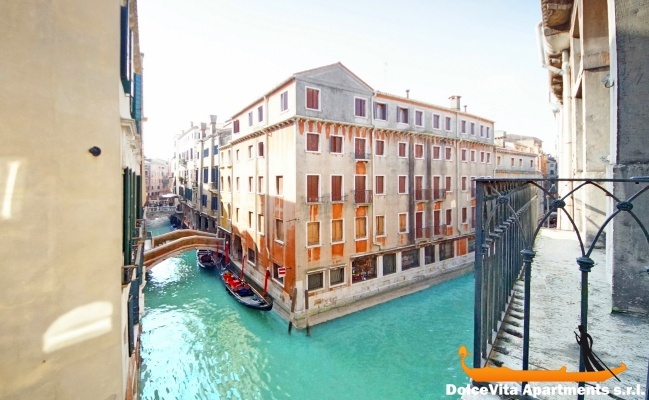 Very nice apartment, located in a quiet place in the middle of Venice just a few steps from the Rialto bridge. Silvio booked us a very warm welcome, answered all our questions and recommended places and restaurants. 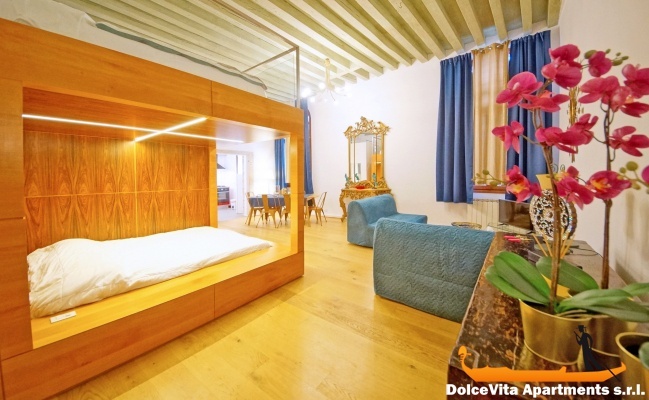 It is very nice, with beautiful Venetian style with wooden beams and high ceilings. It is very well designed and accurate in every detail in order to accommodate a large number of guests without feeling 'too many.' Many beds that although they are all in one open area they still maintain a semblance of privacy. Two nice and spacious bathrooms, a good large kitchen. The apartment overlooks a canal, it is bright and very quiet. The upstream organization, in the person of Mrs Eugenia was perfect, proactive, courteous and helpful. We are delighted with this location very well located. 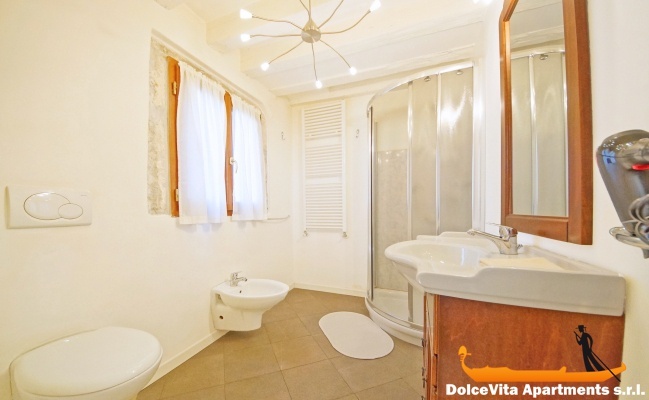 Very well located, 5 minutes from San Marco and 2 minutes from Rialto, the apartment is close to everything. 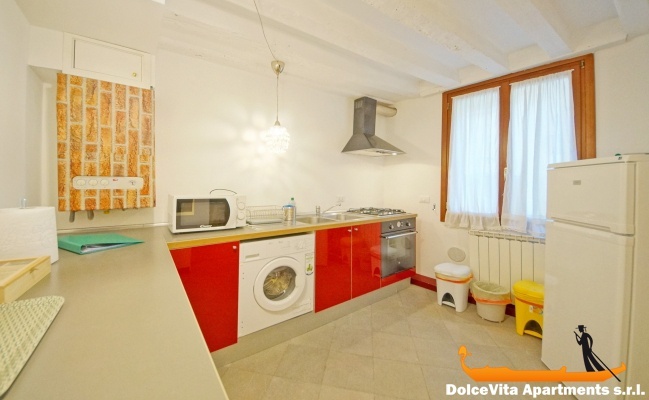 The building is very old outside (it is normal in the center of Venice), but the interior is new, with two double beds, one single, two bathrooms and a beautiful kitchen with all appliances and utensils needed to prepare lunch and dinner. 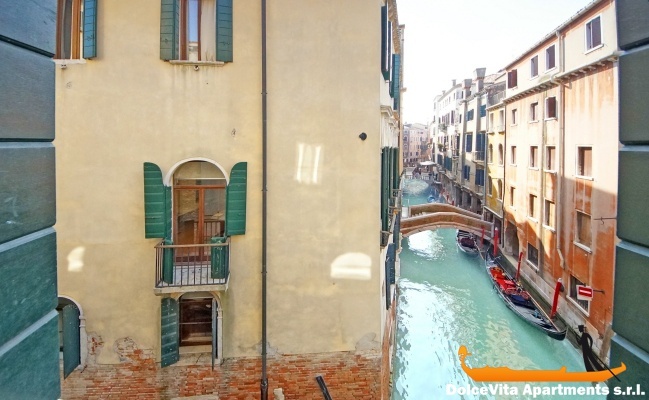 There is also a beautiful view of the canal where you can see the gondoliers to pass. 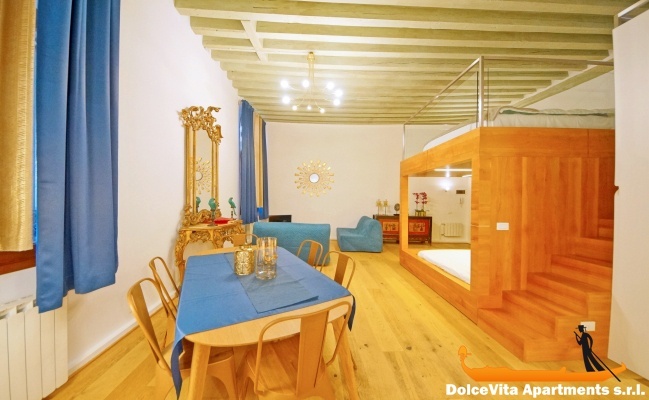 It is so central that you can visit Venice and do lunch and dinner in the apartment, with the savings that this entails. I am very happy with this apartment. Only drawback is stairs to climb: it is located on the first floor, there are not many steps but it is not suitable for people with mobility problems, although this is normal in Venice. There are: air conditioning, microwave, hair dryer, iron, washing machine, hot water, wifi, etc. Definitely I would come back here. I do not give 5 as a score because of the stairs. The service is very attentive and serious: you answered all my questions and requests or by electronic mail and by whatsapp with alacrity. Excellent service. The water taxi stop is just steps from the apartment. Everything was perfectly appointed, and when the water heater had a hiccup, they had someone out to fix it within the hour. The apartment is halfway between the Rialto Bridge and St. Marco Square, so the location was perfect. And the view of the canal was magnificent. Be sure to pack some mosquito repellent so you can sleep with the windows open, it's that peaceful! The service was amazing! I was so worried about getting to the apartment from the airport, but our host made the taxi reservations for us each way. She coached us through the airport and directed us where to go, and then met us at the taxi stop. When the water heater had a hiccup, someone was there to fix it right away. She gave great directions for restaurants and markets, and responded quickly to our questions. A lovely apartment in a really central area. Met at the nearest vaporetto point and taken to the apartment. The facilities were very good and the stay was very enjoyable. The service was good and the apartment was accurately described. Clean apartment very well located, A small downside not much possibility to buy food except for a small co-op which is quite far. About your service nothing to say everything was fine, we will start! 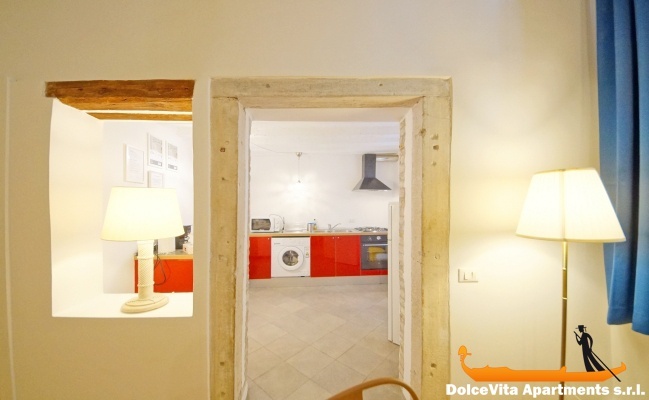 Apartment 168 was very well restored and tastefully furnished, clean, comfortable and very well located. Very good service, linen and homeware lovely, friendly welcome. I am delighted by the apartment 168 I rented. Very good located, it is spacious with an exceptional design! A very contemporary furniture in a period building.